Located on the east bank of the Nile, Luxor was once called Thebes and was the capital of Egypt’s New Kingdom for 15 centuries. This area is the greatest archaeological find in all of Egypt. 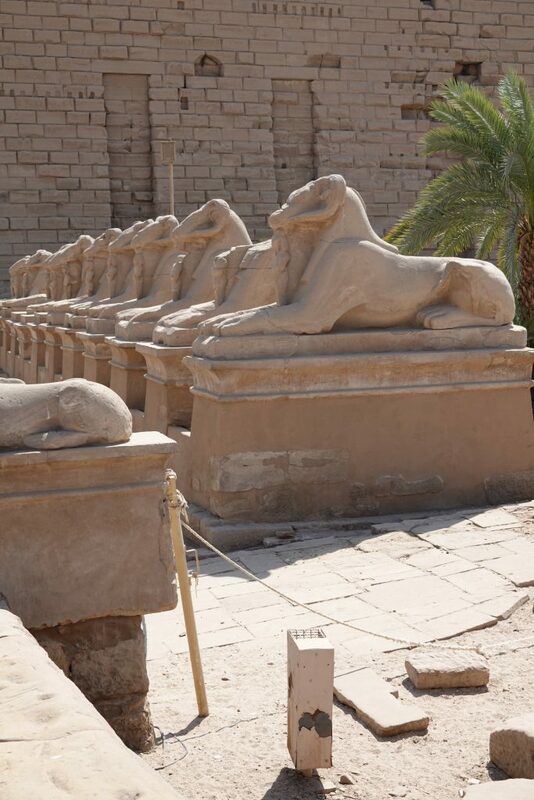 Ram-headed sphinxes line the entrance to the temple of Karnak. The god Amun was worshiped at the temple of Karnak. Beginning with Ahmose, the first pharaoh of the New Kingdom, each successive king enhanced the temple until it covered an area of 18,044 sq ft (5500 sq m). The pillars are fashioned like a bundle of papyrus. Carved cartouches circle the capital of the pillar. 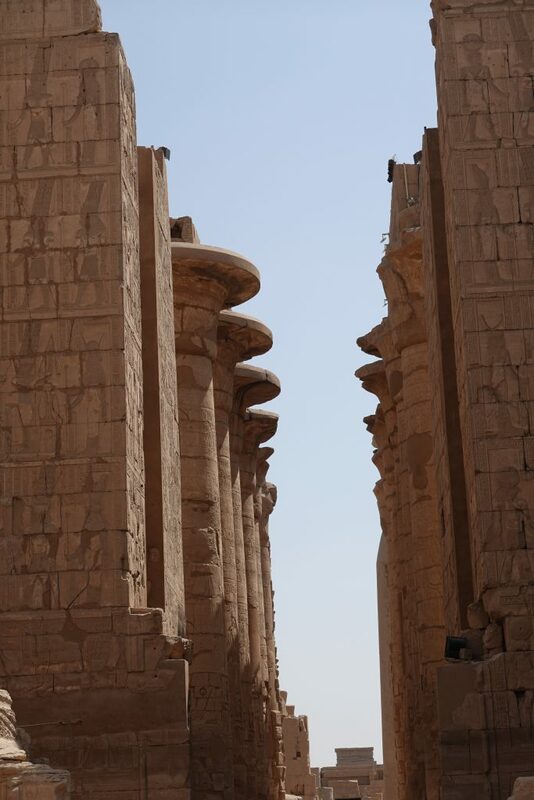 136 pillars once supported the hypostyle ( a roof supported by pillars) roof that covered the hall. 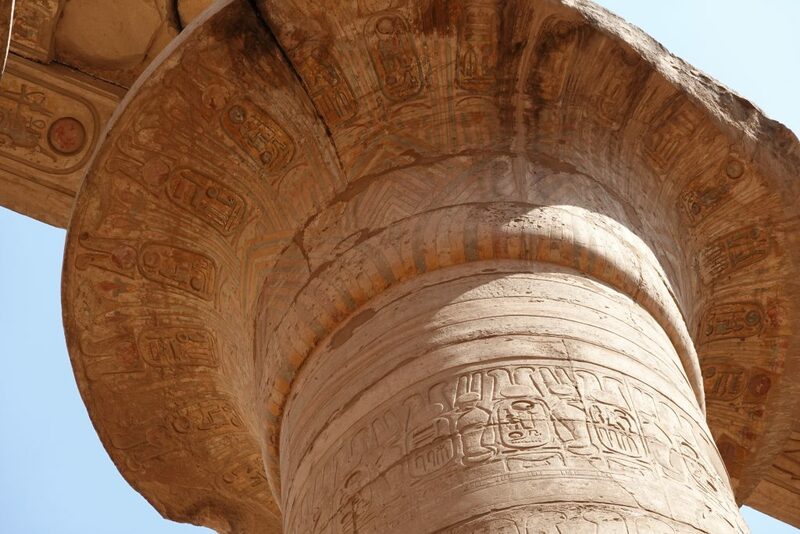 The pillars are carved to resemble a bundle of papyrus. Egyptians believed papyrus surrounded the mound where life began. 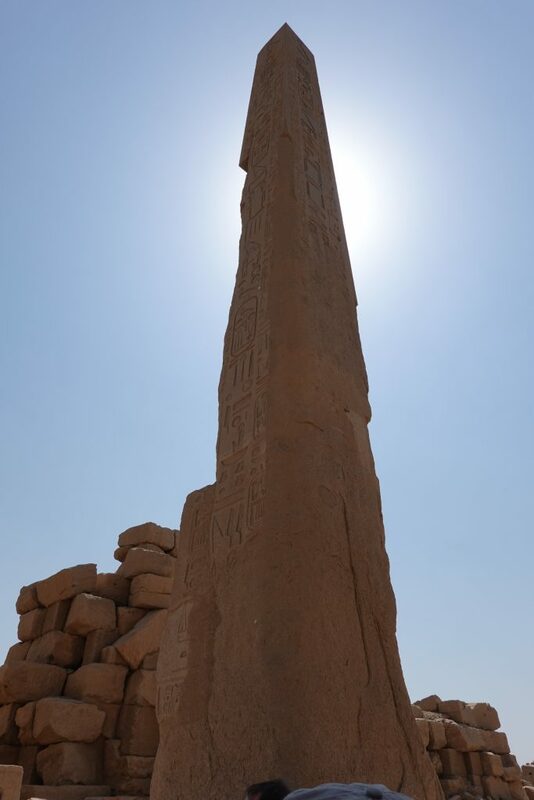 One of the obelisks at the temple of Karnak. The sun was positioned behind the obelisk. The temple is dedicated to Amun-Ra. Ra is the sun god. Amenhotep III began the building of the temple of Luxor and Ramses II continued its construction. 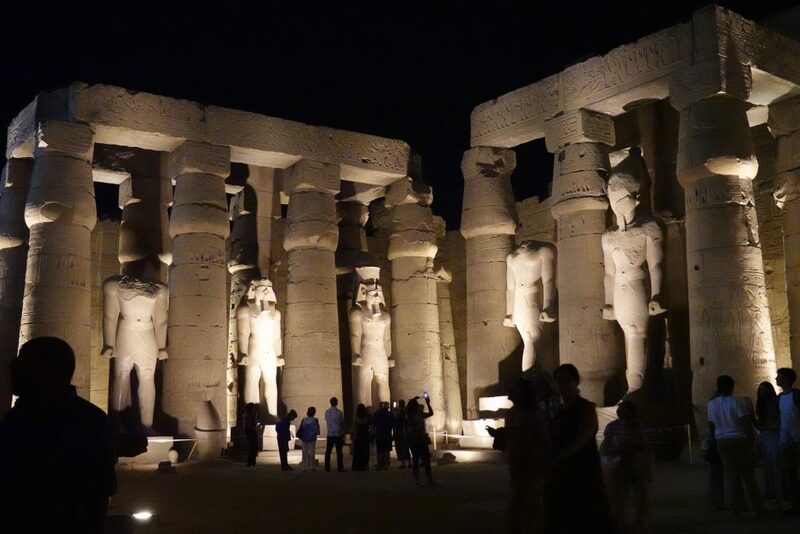 Temple of Luxor is particularly interesting to see at night. This is an example of the pillars. Luxor Temple was built to celebrate the Opet Festival when the statues of Amun, Mut and Khonsu were brought from Karnak to ensure a good harvest. This carving represents the joining of north and south Egypt. North Egypt is represented by the lotus and south Egypt by the papyrus. Seeing the temple in the evening is the best time. It’s cooler and the lighting is well-done. 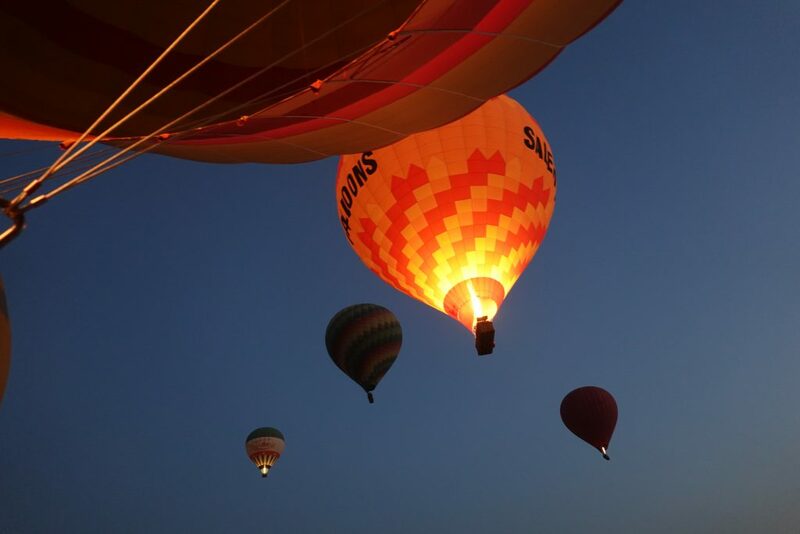 Seeing the sunrise from a hot air balloon is a “don’t miss” experience. We arrived at the balloon lift site around 5:00 am. There were as many as 23 balloons heating up. The baskets can carry approximately 24 people. Our group was about 19. Ascension of approximately 23 balloons to view sunrise over the Nile River. The ascent was smooth as one-by-one the balloons lifted off the ground. Then, what we all came to see…sunrise over the Nile. We were airborne for about one-hour. The captain did an excellent four-point landing in a field. 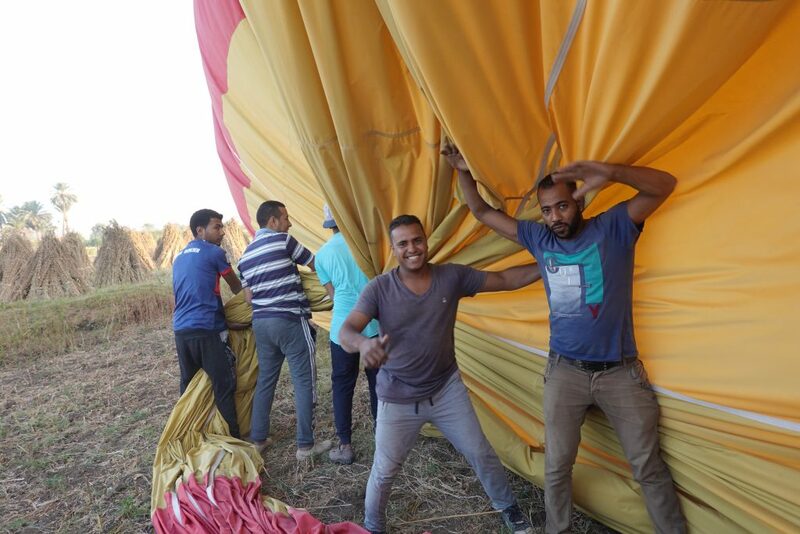 The landing crew gathering the balloon. 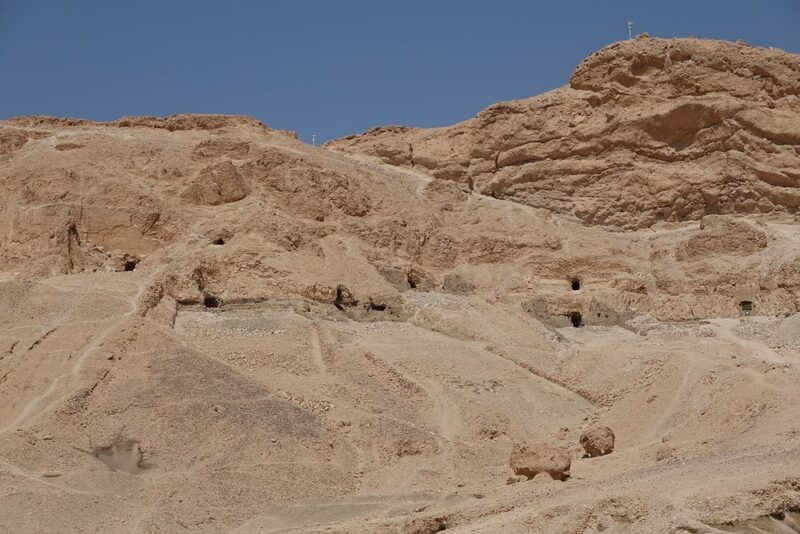 In order to prevent thieves from looting their graves, the kings dug tombs into the sides of the mountains on the West Bank of the Nile. But, the tombs were still plundered. The Valley of the Kings is located in the limestone hills of Quran. 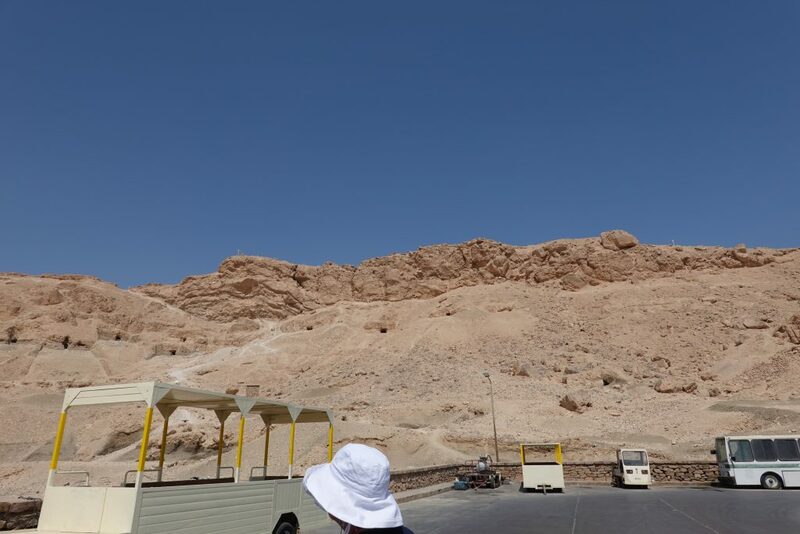 The valley is surrounded by high cliffs where the pharaohs dug into the rock to build their burial chambers. 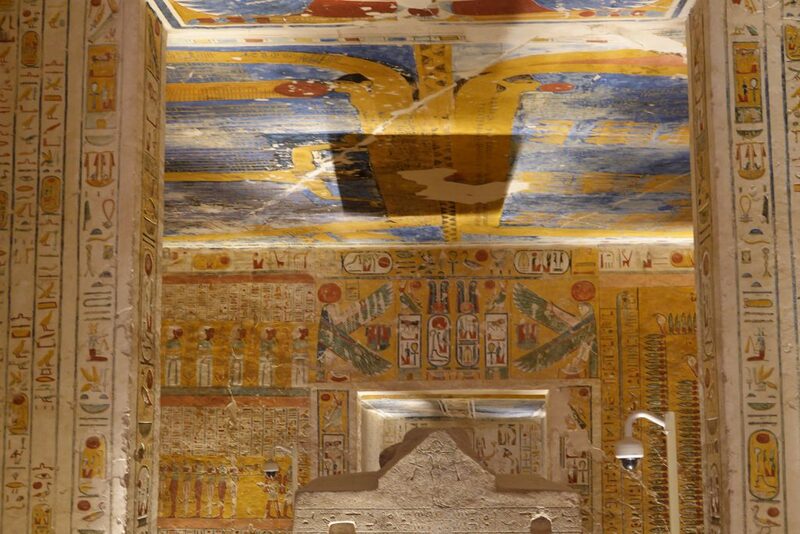 The tomb of Ramses II is the largest tomb in the Valley of the Kings. It was constructed for his many sons with 95 chambers. 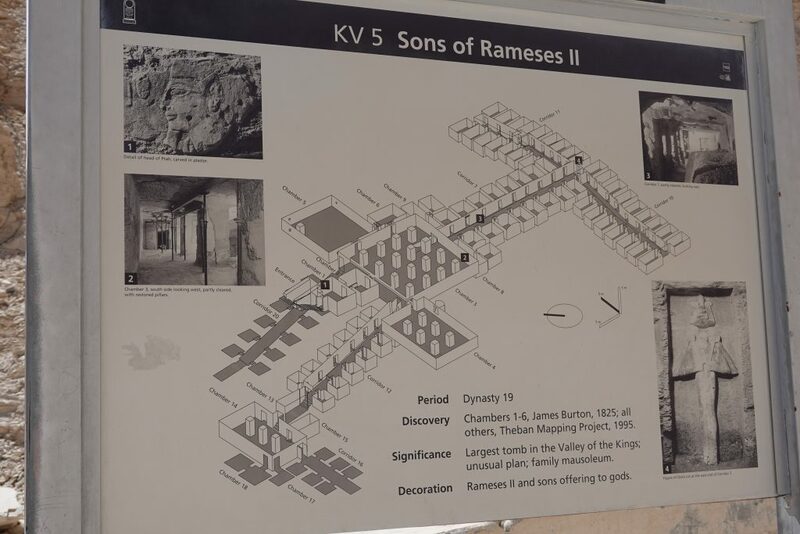 Map of Ramses II’s family mausoleum. 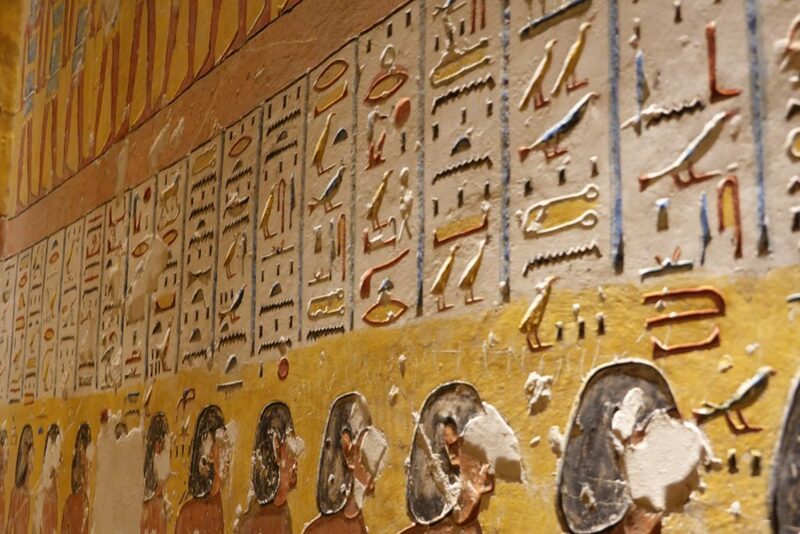 The well preserved colors in Ramses VI tomb. The Greek and Roman visitors left graffiti on the tomb walls. A mark that says: “I was here”. 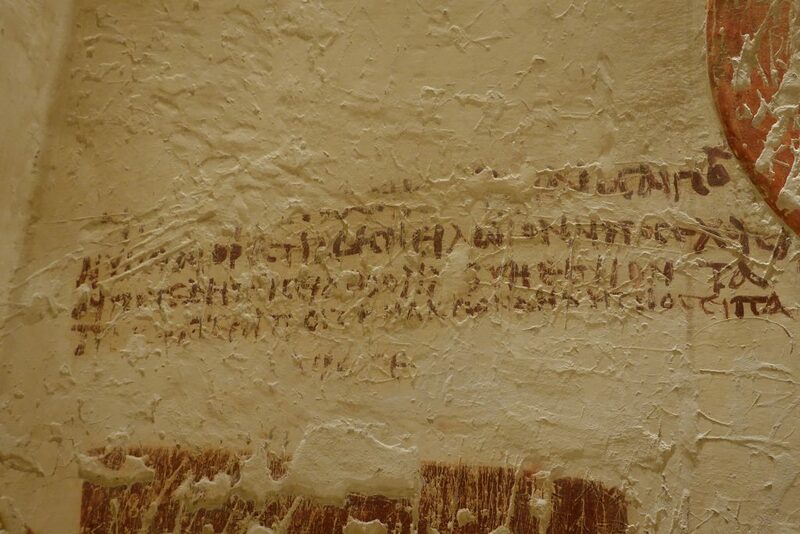 Early Greek and Roman visitors to the tomb left their graffiti on the walls. 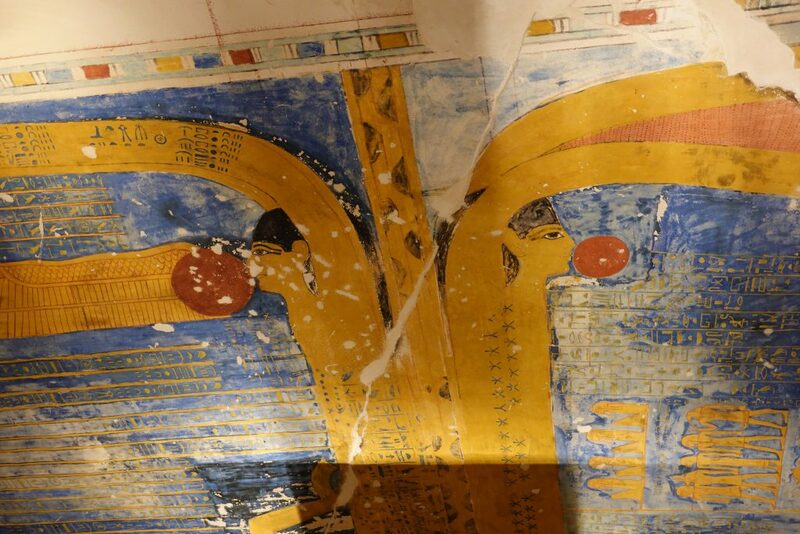 The highlight of this tomb is the goddess Nut and the process of rebirth. Every evening she swallows the sun and every morning, she gives birth to the new sun. The astronomical ceiling shows the goddess Nut reaching across the sky. In the evening she swallows the sun and gives birth to it in the morning. This is a close up of the goddess Nut giving birth to each new day. Hatshepsut’s mother was unable to produce a son, so her father, Thutmose I, remarried. In order to have power, she married her step-brother, Thutmose II. Before his death of small pox, he had a son, Tutmoses III. She didn’t want to share the throne with him so she sent him off to fight the Hittites in order to get rid of him. This created a revenge situation. His relatives vandalized her statues and seals. 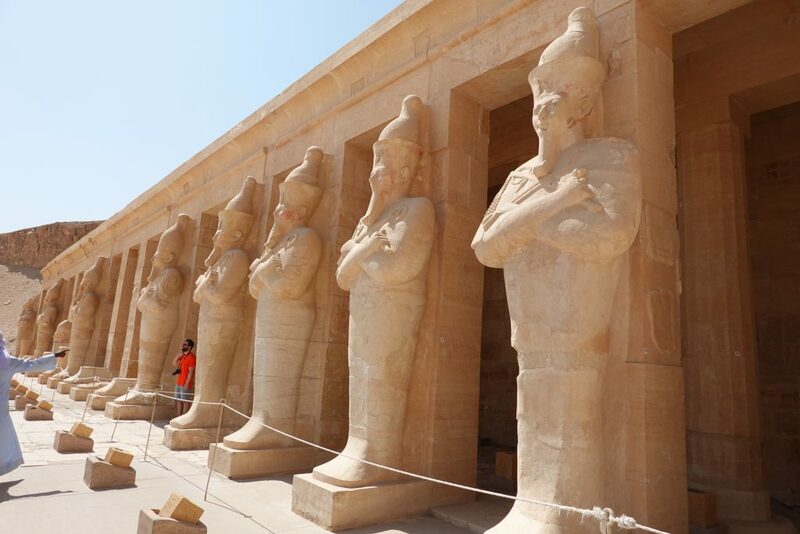 The long line of statues of Hatshepsut in front of her temple. 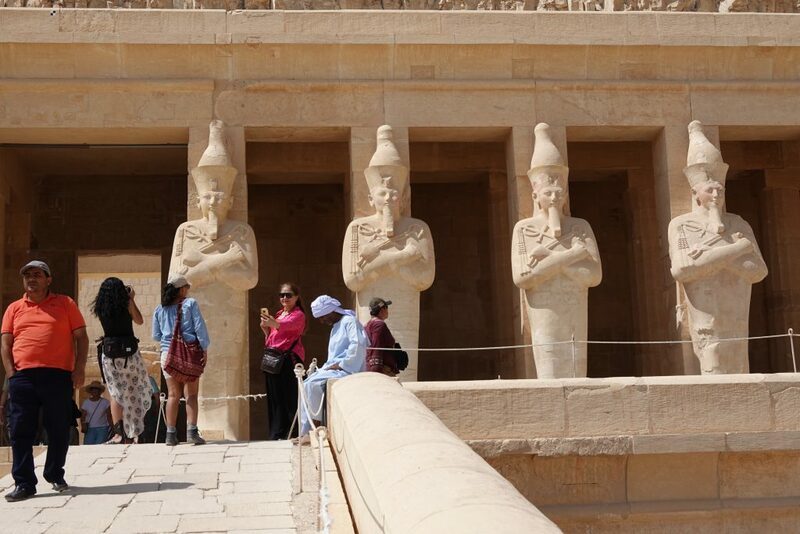 Statues of Hatshepsut. She is represented as a male king with a beard. 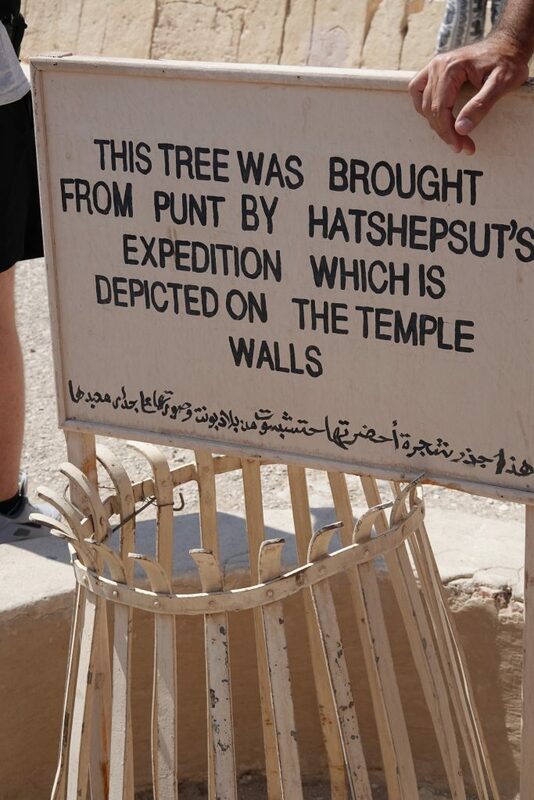 Hatshepsut made an expedition to what was known as Punt (today’s Somalia). She brought back panther skins, incense trees, and ivory. The entrance to the temple must have been impressive lined with Sphinx and sweet smelling trees. 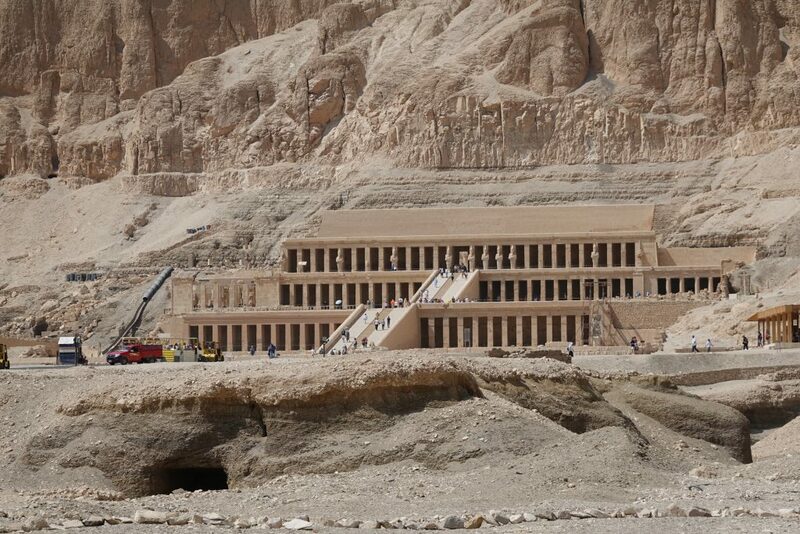 To the right of the temple are the tombs of court officials and possibly workers who built the tombs. Tombs of court officials dug into the side of the mountain. Hatshepsut’s temple was occupied by a Coptic monastery called Deir al-Bahri (Northern Monastery). This occupation helped to deter temple vandalism. 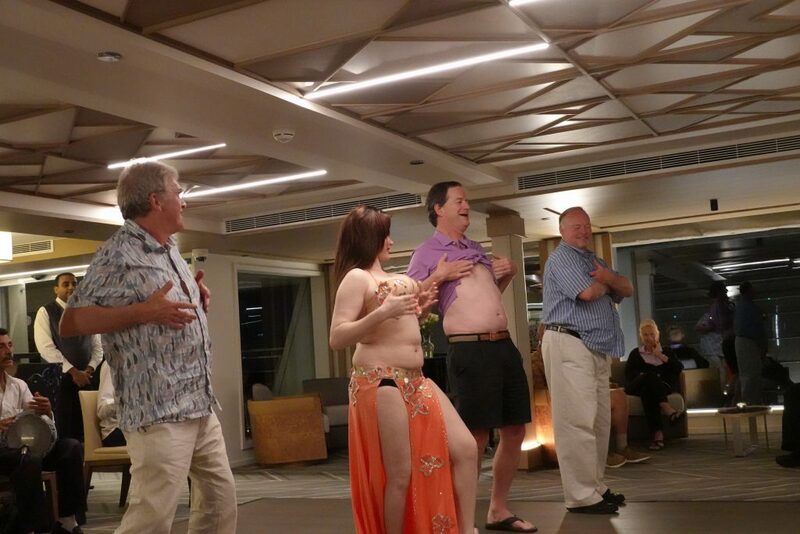 The decline of tourism since the Egyptian recession of 2011 has resulted in fewer and fewer belly-dancers. Belly dancer giving dancing lessons to the male guests. Most of those who perform this ancient form of dance are now foreigners. Here are some photos from the entertainment aboard the Viking ship Ra. Belly dancer showing the guests how to dance. Our visit to the Luxor area was busy, filled with so many different experiences. Next…two smaller towns, Qena and Esna. 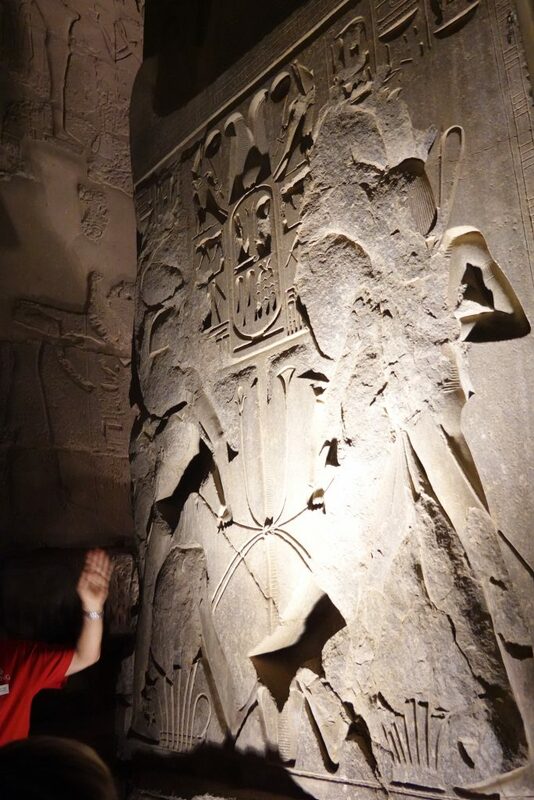 Here we explore the Dendera Temple and the temple dedicated to the god Khnum.